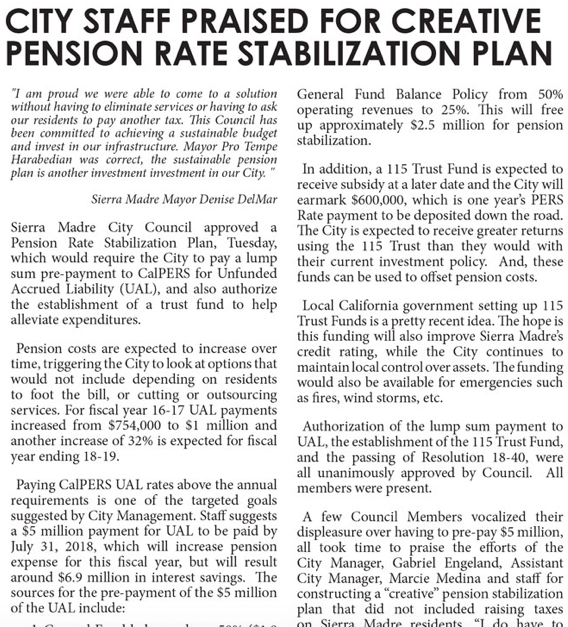 There is a bit of a media blitz going on this weekend about how Sierra Madre is shipping $5 million dollars in funds you might have believed the city didn't have to CalPERS as a way of reducing its dangerous exposure to that failed state pension system. In addition to all of the news published on the City of Sierra Madre site (link), there are two feature stories available right now from what passes for local news coverage in these troubled days. This first one comes from the local newsprint publication "The Mountain Views News," which can be found just outside the front door of many of this area's finest package goods stores. I am not certain what a "Mayor Pro Tempe" is, but I am fairly certain it doesn't have anything to do with Arizona. You can read the entire MVN approximation of reality here. There is also yet another picture of a gnarly car crash, if you're into that sort of thing. But it is part of a different article in the paper. Pasadena Now also has an article out, which oddly enough doesn't mention the $5 million dollar spend it took to achieve the savings proudly being boasted about. A lapse that in my opinion detracts from the overall piece. As pithy as it is. You can read all of this brief summation from Pasadena Now by clicking here. These are a few questions I have. Here is a portion of the staff report that was available a few days before last Tuesday's City Council meeting. You can link to more about this by clicking here. Does that 42% CalPERS pension obligation reduction Pasadena Now briefly discusses happen before or after the expected additional 32% payments increase over the next 5 years has kicked in? Anybody know? Is the reduction on the net liability, or that total payments figure? And is the $5 million lump sum payment included in that 42% reduction number? I get it, these are probably just statistical semantics. So here is my more pressing concern. Since the taxpayers of Sierra Madre just kicked in $5 million dollars to hopefully help with this city's out of control pension debt mess, don't you think some kind of an explanation of how this all happened in the first place would now be in order? Who exactly exposed the city to $28.5 million dollars (current figures) in pension and interest payment debt? Who thought that was a good idea? Or, who was so clueless that they didn't realize that they were setting Sierra Madre's city government on a path to potential insolvency? A threat so real that the City Council had to spend $5 million dollars last Tuesday to stave it off for a while? You'd think for that $5 million dollars in public funds, extracted from the pockets of the citizens of this burgh through some rather stiff taxation of various kinds, the heavy lid would have finally been lifted from this long suppressed story. Don't get me wrong, it is nice that the city is finally doing something to handle its #1 financial crisis. It has been a while since anyone dared to actually face the CalPERS mess. And it is good that City Hall has a City Manager that knows how to function as something of a financial fixer. But judging by this weekend's media blitz, the overall cover-up remains firmly in place. So let's ask these questions again. Who did this to you? What City Council critters from the not so distant past set in motion a series of CalPERS events that still threatens the city with financial disaster over the next decade or two? Despite what the City Council did last week? Apparently that remains none of your beeswax. Remember, some of the same people leading the effort to put in a parcel tax to fund a new $9 million dollar library building got us into this CalPERS mess. Among other equally financially ruinous messes. Probably why City Hall doesn't care to talk about the responsibility thing. I'm watching a rerun of our City Council meeting. As the mod alludes to, this City Council and this City Manager are trying to undo all the damage done by previous Councils. Also, they discussed putting in the flashing pedestrian signs. Quite a few people have complained about how dangerous it is to enter a crosswalk. Even Mayor Delmar commented on how she was hit by a car in the Auburn SM Blvd crosswalk. Gabe said we have money for this, the City doesn't have to pay. I don't understand that part. Switched from the City Council rerun to Meet the Press. President Trump, "What you're seeing and what you're reading is not what's happening." Classic Trump - "Don't believe your lying eyes." 1984, here we are. Somebody needs to let Susan Henderson know that the mayor of the city her paper covers spells her last name Delmar, not DelMar. Pointless task. Ms. Henderson's copy editing has always been terrible. The younger councilman Glen L. asked for a review from the city Finance Director of the new Pension Retirements package, introduced by Councilmember Doug H., before a vote would be considered. No review, the vote was 4-1; the new system was adopted. All is on record, one of the many poor decisions having been reached by a Sierra Madre Council. Doug Hayes? Everybody's Facebook friend? Doug invested heavily in the DSP. And voted for the 2003 water bond. That's why we needed a forensic audit. Thans for the info, 8:26. There's not a damn thing we can do about it, but it's nice to have a clear understanding. 8:41 a forensic audit would be a waste of money this late date. Material from that long ago is long gone, and MaryAnn had all financial reports audited up to date while she was on the Council. Paint the crosswalks with a reflective paint along with the curb crossings. The lighting has been non existent, needs reviewing. The flashing lights may give a false sense of security when entering the cross sections and someone will have to inform the residents of CLIMB that they may choose to ignore or use the new flashing light system. Anyone who believes two white lines or flashing lights is going to some how protect them from the impact of a moving vehicle is nuts. Use your brain. Just a question? First the stop signs on Mt Trail and on Grandview. Then the crosswalks. Now the blinking lights. How many injuries have there been? When will the bridge over the street be installed? Any updates on Sierra Madre's local Jockey Victor Espinosa after his horse died under him of a heart attack, riding down in DelMar? Where there any future discussion items placed in the agenda that will address the state run CalPERS obligations? 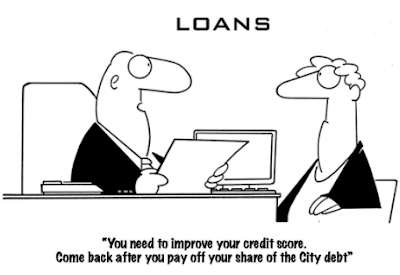 You are paying debts left by a corrupt past city council. But you are not allowed to talk about that. You forgot the pay increases for the overworked staff. 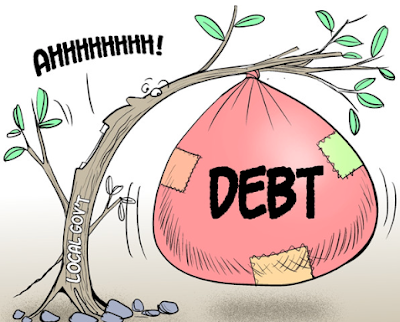 It is nice the city is getting our debt levels reduced. But who was it that got us in debt in the first place? Lol, 9:36am that is a line Abbott & Costello, "who's on first..."
Who first got us in the mess we are in? It's the 5 million dollar joke. My question would be, why is/was more leverage given to certain individuals that interact with City Management? The old DSP crowd is still around. Now they want to tear down the Library. Because they are the ones who backed the candidates and paid homage to the unions. Local politics is no different than national except the crooks are your neighbors. Maybe it's that they are so good at kissing up? I've noticed that developers get preferential treatment. There, it's money. Everything is now for sale. There are some big bills to pay. Thanks to Mayor Doyle and his little buddies. Beside Bart Doyle, there were several others that had their hand in the CalPers and bond mess. Everyone's name should be repeated and not just his. All have dirty finders. The old DSP Dirts, you can spot their handiwork around town. Seems like suggestions that were dismissed in the past are now being put into use. How dumb stringing a banner across the Italian Cypress Trees at the park. Is this an attempt to distract drivers so that they have a better chance of striking people in crosswalks? The odd placement requires that a driver shift their focus from the boulvard. Saw that in Mark Ridley Thomas's district, senior, very low cost and homeless shelter was built as part of the new library installation. This took care of Sacramento's requirements on housing. Sierra Madre should do the same, the back lot just sits empty. Are you nuts? We do not have a homeless problem in Sierra Madre. However, if you build one....they will come and come and come. The library is a historic dinosaur. Make the necessary ADA repairs. Inform the public of new interior spaces for lectures, public meetings, most books are just taking up space, reduce that section. No new upgrades on cable for computers, they are more of a training tool now. Keep the same templet, the building is historical, the Architect is recognized. The Library Board should have input from a much younger generation. The price tag on change is a joke. Go back and come up with more solutions. The financial crisis of the city of Sierra Madre is real. The younger generation will tell the library that they never use it, and maybe then the Library Board will understand. Perhaps a youth will show them how to access Project Gutenberg. The library building is “historic?” You must be joking. The only thing historic about it, is the level of illogical and obtuse attachment that certain people have towards it. The Pasadena central library is historic and beautiful. Ours looks like a Brady bunch turd. If you are trying to make a case to save it because of architecture, you are due for an eye exam and a Zoloft Refill. Not everything old is historic, and just because the architect is “known” doesn’t mean everything he touched is to be revered, unless of course there is something to be revered about a certain project. At least Zoloft is legal. I'm not sure we can say the same for your "influences." Manafort prosecutor says zero ties to Russia will be in trial testimony. You really are going to be disappointed. Just as long as Manatraitor goes to jail I'm good. If the government spent millions of dollars investigating you and your family would they find a crime they could prosecute you or your family for...say putting a tracker on your car and getting you for speeding 60 times in a month and thereby threaten you with years in jail? Would that be good? Instead of investigating a reported crime they instead just examine you until they find one? Aww. That's a sad for reals. Why is Paul Manafort risking it all to face Mueller charges in court? And apparently you’re also good with accusing people of capital crimes with no evidence. If you don’t post your birth certificate immediately on the tattler we wil repeated proclaim to the entire world that you come from Kenya. The California State Attorney General needs to take control of CalPERS funds etc. and take it out of the crooks who are running it into the ground now! Cops are largely behind propping the CalPERS scam. Police unions love CalPERS because it's a House of Cards that seems legitimate. Also, do you remember those McDonalds Monopoly games? Turns out a cop rigged the game. News of the crooked cop rigging the Mickey D's Monopoly game has stayed largely out of mainstream media.